Specialists in the live removal and relocation of honey bees that beekeepers and ordinary pest controllers can’t! Honey bee removal experts SwarmCatcher are THE UK specialists in removing and relocating unwelcome honey bees that have arrived at a property and taken up permanent residence in a place they shouldn’t have. Here on our site you will find a lot of information about options for removing and relocating honey bees to enable you to decide on what best to do. We have split these options under three main categories. We are slowly filling our site with numerous examples of honey bee removals that we have carried out over the past few years along with an abundance of information about these honey bee removals. If you feel that we have missed out on a topic please let us know so that we can provide you some appropriate information. If you want to deal with people that understand your problem from both your side and the bees side then you are in the right place. During our process of learning about how to remove honey bees live safely we have met and talked to many interesting specialists from both this country and abroad that we still call upon for some very useful advice. 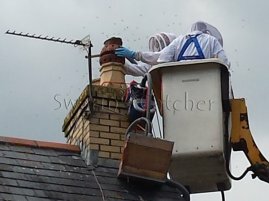 For example we spent a week on a chimney sweep course so that we better understood what we could and could not do to remove bees from chimneys. 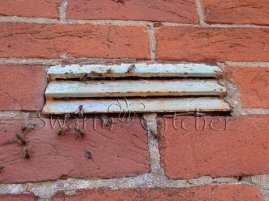 There are several out there that don’t seem to have any concept of the dangers that they create when carrying out these honey bee removals from chimneys. Obviously when accessing the honey bee colonies in the chimney or the roof we need to utilise access equipment. We are fully IPAF trained in the use of Mobile Elevated Working Platforms (cherry pickers and similar to you and me). We are PASMA trained to ensure that we use our mobile scaffolding tower equipment properly when accessing honey bee colonies in soffits and other places. We fully understand the law and how it affects you. its pretty straightforward really – you can kill honey bees. BUT and its an enormous but, you need to fully protect the exterminated honey bee colony from being accessed by any other bees. This is not nearly as straightforward as you may think and is nigh on impossible to do without getting up to the entrance points (and there will usually be more than one). If you can access the entrance points you are halfway to removing the exterminated bee colony, and if you can remove an exterminated bee colony then you might just as well remove it alive. We are uniquely qualified in understanding your problem and being able to advise you on the best solution. We are both beekeepers and pest controllers. We are fully insured and specialise in the removal of bees from walls, roofs, chimneys and other unusual locations. To see more about how we go about removing the bees from any of these locations please follow the links below. Even better give us a call to talk about how we can help you remove the honey bees LIVE. Do you have an unwelcome bees nest? Call us now! 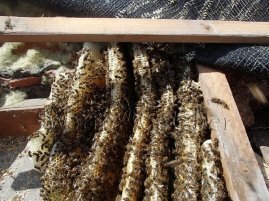 The bees and honeycomb are extracted and relocated without using insecticide. We then proof and reinstate to prevent more bees reoccupying. There’s no need for an expensive false guarantee linked to reoccupation of bees to a specific spot on your property. Seriously, read any guarantee offered and carefully think about all the get out clauses it has. Rather than false guarantees be assured that we have carried out the work correctly and properly, but if a short duration guarantee full of get out clauses is important we can discuss it. This ethical and correctly carried out live bee removal and relocation service is provided by relatively few people within the UK, and even fewer that are properly insured for doing so. We are insured to carry out all aspects of the work, we just aren’t the type to do it any other way, and have been doing so for many years. We advise on how best to use specialist contractors to create the most financially beneficial honey bee removal and relocation service. We are proud to have worked alongside some of the many UK specialists providing chimney repair expertise, multi-fuel stove installations, building repairs safe in the knowledge that they too carry out their work in an equally particular manor. Our methodology does not contaminate the environment, damage your home, kill other bee colonies or allow insecticide to enter the human food chain and eliminates the possibility of being fined for not complying with the law and various regulations. There’s rarely a need for a very expensive bee survey that tells you little or for a drone to take aerial photographs of what is already known, all that is usually needed is a few photographs and some questions answered for us to be able to give you a guide on what is required to remove and relocate the bees. Of course if you have had a survey carried out then please send us a copy so we can discuss your situation or just give us a call or fill in the “contact us” form so we may get back to you. We capture bee swarms. We rehome honey bees. Contact us now if you have a swarm or colony near you. Please give us a call at 02922 401649 or use the contact form below. Our honey bee loving Specialist is waiting for your call or message! After 3 years of having bees buzzing around the roof gable end of our converted barn, and having had our youngest son stung a couple of times, we decided it was time to deal with the problem. Having had some advice but little help from the local council, we were put in contact with Swarmcatcher through somebody local who had used their services before. During the week after Easter and after having a scaffold frame installed, Ian arrived to do the tricky job of locating the nest under the slate roof tiles and then remove them. With help from Tony, they worked for over a day, carefully removing tiles and then having isolated what turned out to be a larger nest than expected, removed all the bees and comb – and all of this carried out wearing protective clothing and working at a height of about 30 ft.
We had nothing but praise for the work they carried out. Ian was incredibly knowledgeable about bees in general (bee management has been in the family for generations) and was happy to answer all our questions and educate us about the life cycle and social make up of these most amazing creatures. Their work was done efficiently and effectively and any mess was cleared up without any prompting. A bonus for us was to have the some of the delicious honeycomb from the nest and there was so much in the nest there was plenty to share as well as to feed the bees as they made their way with Ian to Wales and to their new apiary. We are so glad we did not follow some advice and have the bees poisoned and we were very lucky to have been put in contact with Ian and the Swarmcatcher’s service whom we would highly recommend to anybody who wants to remove their unwanted bees with care and understanding. Many thanks Ian! very helpful telephone advice after another company was going to overcharge for removal of Tree bumble bees. We’re going to leave them alone &live in harmony instead!